I mispoke – the ice the forms below the detritus is needle ice, not hoar ice. Hoar ice forms below snow and causes avalanches. 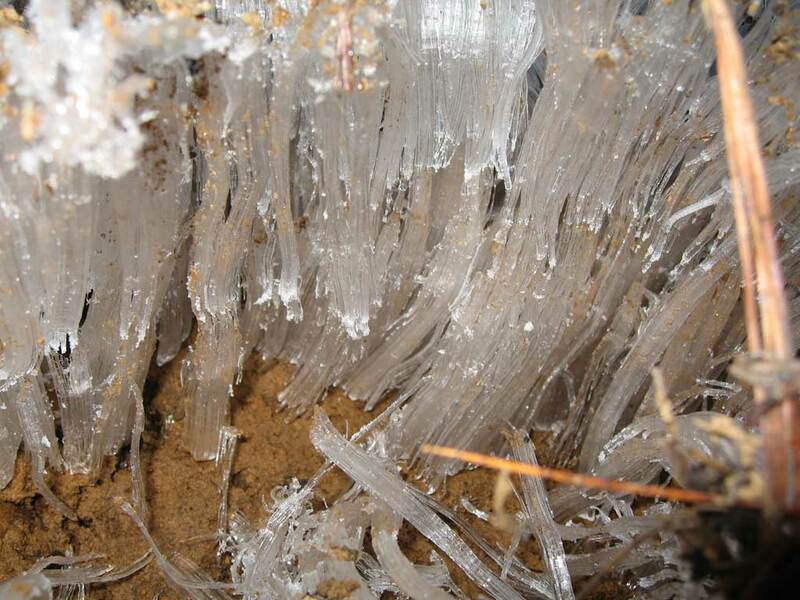 Needle ice occurs in soil where water seeps to the surface. The water freezes when it comes into contact with the air, but water below keeps pushing. Here’s a picture from snowshoeing this past weekend. It was the largest heaving I’ve seen where the ice crystals extruded a good 6″ from the ground. oh, and here are some cool ice ribbons. Thanks to a lot of help from John Westerfield, my sister has a functioning and current photo gallery back on the web. It’s something I’ve been neglecting, but the site looks great. So do the photos. What happened to the dot.com domain? Squatters. I hate domain squatters. The irony is that sampling could greatly reduce the cost of taking the census and provide more accurate information than a full census. Yes – a government program that is incredibly useful to the government itself, academia and research, and extensively by businesses in understanding our populace. A little more info here at washingtonpost.com. What a great beard. I caught up with my fellow Foggers this weekend near Mt. Hood for some snowshoeing and charades. It’s only the third time I’ve been out on modern snow shoes, and I must admit that I quite like them. I can’t remember the trail’s name, nor the lake we shoed to, but we were on the PCT for the majority of the trek. The only drawbacks I see to shoeing are when you have a nice level stretch you could glide on with skis, and of course, going downhill. The weather was just about perfect and we even got a nice glimpse of the mountain afterwards. Suddenly this has become a 4-day weekend. Posted on January 16, 2007 Categories blahblah4 Comments on Snow Day! Today I installed window replacements numbers 6 and 7 of 11. My parents came over to help, but about 4 pounds into the project, a piece of art made from an old venezuelan oil barrel fell on my dad’s head. The rays of the sun (that’s what the piece is) became impromptu saw blades and split a 1-2″ cut into his forehead. While he worked on gluing the cut back together, I was able to install the two sash-pack windows. Each window installation goes faster than the last, and I’m thinking by window 10, they’ll just start ordering and installing themselves. Why replace the windows? Doesn’t it take away from the charm of the home? Not really. These two clearly had some draft issues and when I took out one of the windows, I found 50+ hibernating ants. The room is quieter already, but now I have to paint the buggers. All 7 of them. One of these days. Well, not exactly. Assuming you have very detailed data, they can tell where you parked your vehicles 2+ years ago. Google doesn’t provide live data. I suppose if Coalition (there’s still a coalition, right?) would hurry up and bring peace, they wouldn’t have to worry about aerial data catching up. In all seriousness though, the use of tools like Google Earth are easy to point the fingers at. If GE wasn’t available, there would be plenty of other resources for insurgents to use to help target stationary objects. I would assume that there are still paper maps, and someone that can fire a mortar would probably know enough math to triangulate based on map coordinates. GPS units are dirt cheap now too. One of the perpetual fears of having geographic and other non-spatial data publicly available is that it will be misused. It is my belief that the benefit usually outweighs the costs, and anyone sufficiently determined will figure things out without the aid of tools like Google Earth. I have trouble believing that someone decides to mortar an army base because the software made it look easier. It’s days like this I hate going to work. Walking Barley this morning was a delight because the sky was absolutely cloudless and the sun rising was framed with perfect dawn colors and silhouettes of trees and rooftops. The bus ride to work allowed me to enjoy the brightness of the city in early morning. Wisps of steam of the power plants on top of buildings, the shiny red of alder branches in the hills, and the clean white of the volcano to the east. Even my walk to the first meeting of the morning was pleasant; dry grasses with glowing yellow in the sun, frost on moss between bricks and the strange glacial blue of melt-off crystals on the ice spots were all too photographic for the morning to be spent looking at a screen. It’s also days like this I’m glad I’m not homeless. My fingers ached after walking Barley and scraping two sets of windshields. Feeling the cold in your bones is nice when you know you can get out of it. 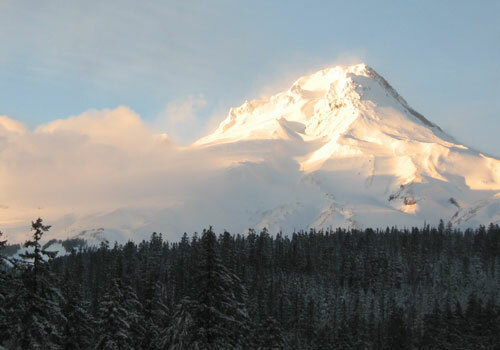 Portland is having “special storm coverage” on most media outlets again today. It’s quite embarrassing, and it’s making us soft. Should I get sealed earbud headphones? I think so. The arguments for seem to outweigh the arguments against. The guy and the girl behind me that are flirting like they’re still in the high school band. Being aware of your environment is important. Safety I suppose, but more importantly, social interaction is nice. Can’t wear them on a bike either, that would just be wreckless.